How to Succeed in Business Without Really Trying is a musical with music and lyrics by Frank Loesser and book by Abe Burrows, Jack Weinstock, and Willie Gilbert, based on Shepherd Mead’s 1952 book of the same name. 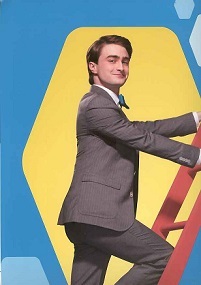 The march 2011 revival starred Daniel Radcliffe and John Larroquette, Darren Criss succeeded Radcliffe in the role of J. Pierrepont Finch for a limited three week engagement which started on January 3, 2012 and continued until January 22. Beau Bridges replaced John Larroquette as J.B. Biggley starting January 3, 2012, Nick Jonas took over the role of Finch on January 24, 2012, Michael Urie replaced Christopher Hanke in the role of Bud Frump starting January 24, 2012.The production closed on May 20, 2012 after 30 previews and 473 regular performances. This Beautiful Souvenir Brochure is from the 2011 Broadway Production OBC. Large Format Great Information on the show and cast also includes colour pictures from the show a must for any collector.